Personalized wedding ribbon has got lots of uses in decorating your favors, invitations or wedding gifts. To ensure that you don't spend a fortune on the ribbon make sure you shop around, the internet is a great place to compare loads of different shops. I have found a few online stores selling some reasonably priced ribbon which I have put at the bottom of the page. When choosing your wedding supplier check to see how many characters they will print, the choice of colors for the ribbon and the foil for the printed words. The ribbon will then be sent to you in a roll to avoid it wrinkling or fraying - remember this as you will need to be cutting all the individual ribbons! Or you can pay extra and have the ribbon pre-cut. Your personalized wedding ribbon can be used to tie your wedding favor bags or boxes. Practice on how the ribbon will need to be tied so that the printed detail is visible - otherwise it would be a complete waste! A word of warning, make sure you have the patience for tying all the ribbons or ask a patient friend - it can get very frustrating. In other words you may want some extra ribbon to ensure everyone's favor is covered! Other sweet ideas to make cheap personalized wedding favors is to tie the ribbon to candles or to frosted packets of seeds or crystals. 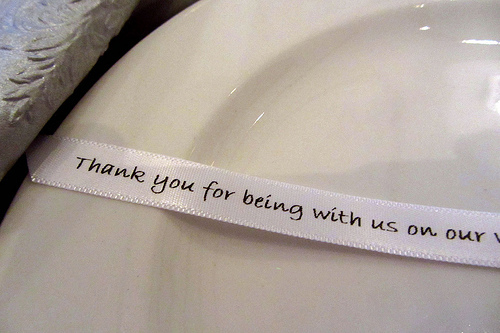 Have a look here for more ideas on how personalized wedding ribbon can add to your wedding favors. MyWeddingFavors.com - A bit more expensive but they have the option of having the ribbon pre-cut for you and they have extra favor ideas like ribbon wands! Plus you can save 5% on your order if you use the coupon code SAVE5 so it probably works out about the same cost in the end! The Knot Wedding Shop - the cheapest ribbon, available only in one size 5/8" but lots of colors and also a choice in font on the ribbon.